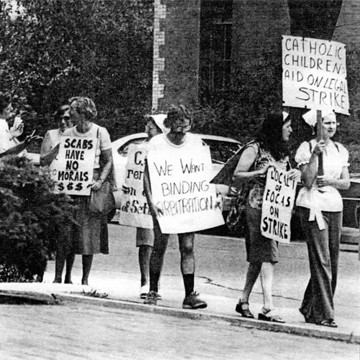 Catholic Children's Aid workers strike, Toronto, Ontario, 1977. Courtesy of the Catholic Children's Aid Society. The Chinese first came to Canada as labourers. Some Chinese Canadians, like Alice Yeh, supported workers’ rights throughout their lives. In the 1960s and 1970s, Alice Yeh was employed by Catholic Children's Aid in Toronto, Ontario. She enjoyed her work, and took pride in her professional accomplishments. When her workplace went on strike, Alice joined her co–workers on the picket lines in a show of support for workers’ rights. In the accompanying audio clip, Alice recalls her involvement in the strike.